Forecast: The Thursday program begins with a difficult state-bred entry-level allowance turf miler. The course likely will have some give to it due to recent rains. Lil Milo really isn’t bred to run this far (his sire Rocky Bar gets mostly sprinters) but the Marquez-trained gelding is tough and genuine and if given an easy front-running trip could take this field a very long way. Acclimate lands the good rail and should settle into an ideal pace-stalking, ground-saving trip. He’s a tad light on speed figures compared to par for this level but this appears to be a moderate race for the level, so he’s a fit. Jet Set Ruler is the most dangerous of the closers, and if the pace is stronger than average – and on paper it likely will be – the Tribal Rule colt will be heard from late. He’s been away since October but his San Luis Rey Downs work tab for Baltas should have him fit enough. Forecast: Sergio finished far back in his recent comeback – he had been away for a year and understandably weakened in a two-turn assignment – but for new trainer Miyadi and turning back to an extended sprint the five-year-old gelding should produce a significant forward move. The barn hits at a terrific 29% first-off-the-claim, and this son of Broken Vow has a back few numbers that would easily beat this field. Brioso takes a sharp drop in class and should be competitive in this league. He has the route-to-sprint and turf to dirt angles that we like and a bullet recent workout at San Luis Rey Downs, and also will benefit greatly from the switch to Rosario. We’ll use both horses in rolling exotic play with preference on top to Sergio. Forecast: ​The third race, a maiden $50,000 claimer over a mile on turf for fillies and mares, kicks off the Pick-6 and offers several possibilities. See That Kat exits a much tougher straight maiden event and shortens from nine furlongs to a flat mile. The daughter of Animal Kingdom retains Prat and should be prominent throughout and have every chance. Beyond Pleasure loses Prat but picks up Rosario and will benefit from the good rail draw. This will be her first try routing, and if she’s ever going to handle two-turns it will be in her first attempt. On pure pedigree she shouldn’t be inconvenienced so at 6-1 on the morning line she has to be used. The Nine O set the pace but then weakened late in the same race See That Kat exits and today adds blinkers while turning back a furlong. She’ll likely be the pacesetter if she wants to be, and in a field lacking in effective closers could be tough to run down. Let’s use all three in our rolling exotics while giving a slight edge on top to See That Kat. 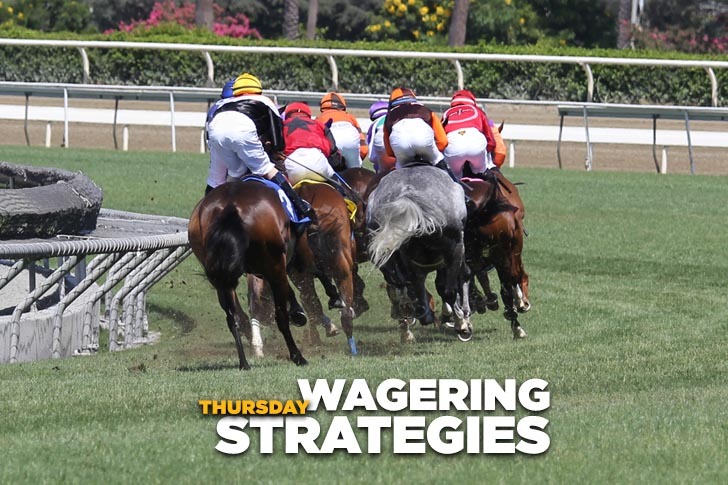 Forecast: We’ll pass this race, a starter optional claimer over a mile on the main track for 3-year-old fillies, while going three-deep in our rolling exotics. Very Strong Baby was a solid runner-up under these conditions in late November and not much more will be needed to beat this field. She gets a break in the weights with the switch to hot bug boy Figueroa and will likely draft into a cozy pace-stalking position. She’s 9/5 on the morning line and could go lower. Equal Measures, claimed in both of her starts to date and now in the Hess barn, switches to Rosario, gets the rail, and boasts the two-sprints-and-a-stretch out pattern. She may be the one they all have to catch. Sass Machine isn’t fast on numbers but at least she’s improving, having finished a solid runner-up vs. similar last month. She switches to Desormeaux – a live rider for the Morey barn – and with another forward move today should make her presence felt from a pressing position. Forecast: The Hunted may prefer a mile to nine-furlongs, but he continues to impress in the morning (see “Primed and Ready” video) and makes a major jockey switch to Prat. The son of Unusual Heat should enjoy a trouble-free trip from a pace-stalking position, so at 7/2 on the morning line he gets top billing. Avalanche is winless in 10 career starts over the Santa Anita turf but ran a terrific race here on opening day when a fast-finishing fourth (beaten a half-length) in the same race The Hunted exits (he finished fifth). He’s back with Rosario and has run well for him in the past, so with good racing luck and a little help up front the son of Mizzen Mast could be hard to deny in the final stages. Oscar Dominguez exits the much troubled San Gabriel Stakes-G2 and can return to good form in this much more realistic spot. Three of his four career wins have been accomplished over the local turf course and “win rider” Talamo is back aboard. Forecast: ​Secret Spice earned a speed figure that would make her competitive in the Breeders’ Cup Distaff when she won by more than 11 lengths in an allowance race over this track and distance during the fall meeting. Away since then but training like she’s “primed and ready” (see video), the Baltas-trained daughter of Discreet Cat beats this field with anything close to her best effort. She’s 5/2 on the morning line and we’ll take it if we can get it. Bashful won her first two career starts like a filly with a huge future while employing as style that suggests she’ll be at home over a distance of ground. She’s likely to continue to improve with experience and two-turns, but on pure numbers she has a whole lot of work to do when compared to Secret Spice. We’ll have Bashful on a few rolling exotic tickets for protection, but the main push goes to Secret Spice. Forecast: Builder should beat this field – he rates top billing mostly by default – and we’ll single him in rolling exotic play. Truthfully, it could be him, or just about anybody else, so if you believe the Belvoir-trained gelding is vulnerable you should spread as deeply as you can afford to. Builder has finished second in three of his last four starts with steadily rising speed figures but has just one win to accompany six seconds or thirds in 11 career starts, so he’s probably not one to fully trust. This is a race we’ll treat with kid gloves and not try to get too involved in. Forecast: Seven Oxen is drawn poorly outside but otherwise looks solid in this maiden $50,000 claiming turf miler for 3-year-olds. If the Desormeaux brothers employ patient tactics, this son of Oxbow should be able to produce the last run. Leader of Men exits the same race that Seven Oxen does and today shows up as a first-time gelding. He’s another that should do his best work from off the pace. Frozen Money adds blinkers for the first time after hitting the board in all three career starts, though he did flatten out under pressure in the final furlong in each outing. However, he’s a fit based on figures, so if the hood helps at all he should have every chance when it matters the most.